A crafty little plot of lies and deception that works for three quarters of the film, but then gets very unsettling for the finale. 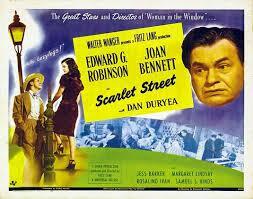 Scarlet Street is a pretty cool older movie. It’s an Edward G. Robinson film from about a decade after his gangster movie days. By this point, he had gotten a little bit older and was playing older roles, like in all my sons, where he played the father to a war hero. 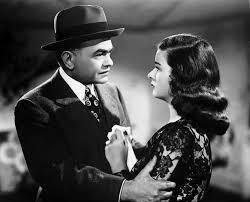 Here, in Scarlet Street, he’s a simple man married to a woman who was married once before, and then became a widow. He’s not especially happy with his life, or with his wife, who is overly nagging and unsatisfied with him. The real plot of the movie gets started pretty quickly, following an honoree dinner where Robinson receives a promotion. The point of that dinner is for Robinson to see his boss leaving with a much younger woman and to comment on how his boss has it all figured out and is living the good life. Now Robinson leaves the dinner, walks his friend home in the rain, and catches a glimpse of a man beating up a woman in the street. That’s the big event that sets the movie off. Robinson runs over and saves the woman, and next thing you know, he and the woman are going out for late night coffee together. I love how the coffee shop is right under her apartment. So convenient. During this coffee scene, Robinson reveals that he likes to paint, and the woman mistakes him for a well-known painter who is loaded with money. Robinson never says any of this, of course, but he is willing to go along with it just the same. Robinson and her talk about how despite their age difference, maybe they could date, and then they part ways. As things turn out, the woman has a boyfriend named Johnny, who is the very same man that was fighting with her when Robinson first came along. Johnny is a pretty scummy character, only interested in money, and he convinces the woman to date Robinson and persuade him to give her money. And so she does. He ends up taking out a huge loan in order to buy her and apartment, which also serves as a place for him to paint and keep his finished paintings afterwards, getting them out of his wives’ hair. So far, the movie is fun, but still kind of routine. Things get really interesting when the woman and Johnny decide to start selling some of Robinson’s paintings, thinking that he really is a famous artist. Johnny brings the paintings to a man on the street and sells them. Then a famous art dealer comes by and sees them and wants to put them in his collection. Soon, the dealer is being brought by the street merchant, over to Johnny’s place to meet him and find the artist. And Johnny tells the dealer that the woman is the artist. She goes along with it, just like how Edward G. Robinson went along with the idea that he was an artist to begin with. And now his paintings start getting published and recognized and famous. Only it’s not his name that’s on them. It’s hers. At this point, the movie is really moving along nicely, everything flowing, and both in both an interesting and creative manner. Robinson’s wife sees the paintings in a window and thinks he copied them from the store. He goes to check it out and then confronts the woman, and being the nice guy that he is, he’s okay with it all. He’s okay with her selling his paintings and taking credit for them. He’s just happy that people are considering his paintings to be works of art. But then the inevitable happens. The ending that we all saw coming falls on us as Robinson discovers the woman’s secret about how she is really with Johnny. Up until now, the woman was able to play it off that Johnny was actually the boyfriend of her roommate. But now Robinson catches them together, when they don’t know he’s there, and at last the secret is out. I’m not one for giving away endings, but considering that the last part of this film is the only problem I had with it, at this time I’m going to need to start getting into it. So spoilers ahead. If you haven’t seen the movie yet, read no more. The movie should have ended with Robinson parting ways with the woman and going on to become a famous artist. Maybe he could have claimed that he was the artist, and she claimed that she was, and they would have a sort of art competition to prove it. And the punch line would be that her painting came out terrible and in the end, even Johnny didn’t want her. Or she was taken away to prison for fraud. And in any of those circumstances, it’s a happy ending for Robinson who goes on to receive the fame and success he deserves. But that’s not how the movie goes. Instead, Robinson waits until Johnny leaves and then comes out of the shadows to confront the woman. She taunts him and calls him terrible things, and he grabs an ice pick and stabs her to death. Pretty racy for an old black and white movie. The stabbing all takes place with the woman under a blanket, so that we don’t see much, but even still, it’s a crazy idea. And it leads to Johnny being convicted of the murders, which also would have been okay. Except then Robinson goes crazy at the end, hears the voices of those who died because of him, and becomes a homeless man. The very ending has him as a bum, walking past a store window where one of his paintings has just been sold for thousands of dollars. it’s meant to point out the irony in a black comedy sort of way, but it’s a little too sad. Robinson was a poor nice guy and the movie ended him off in a terrible place. It was a creative ending and very twisty, and I suppose seeing something totally unexpected like that is a lot more exciting than seeing the same old thing. It just wasn’t in any way a feel good ending. We were rooting for this guy the whole way and watching as he got used and abused and in the end, he gets punished even more. It’s just a little too extreme of an ending. Otherwise, the movie was great. Smart and unique and very clever. It was a Fritz Lang movie and apparently his favorite of all of the American movies he made, and I totally see why. It’s a very strong and entertaining film.